Park Bo Gum, a famous actor in South Korea visit Indonesia again through 2019 Park Bo Gum Asia Tour “Good Day” in Jakarta. His arrival has become a cure for fans’ longing since the last time Bo Gum greeted fans in 2016-2017 Park Bo Gum Asia Tour Fanmeeting in Jakarta “Oh Happy Day” in 2017. Marking the start of the event, Bo Gum appeared charming in a suit while singing ‘I Like You’ by Day6. His sweet voice echoed throughout the room, making fans more enthusiastic about joining the fan meeting. If you could turn back the time, what would you to make it better? lot to improve. So instead of fixing it, I’d better organize the future better. If you did not become an actor, what would you probably be doing right now? What is your life motto? Is there any change in your life motto before and after you debut? tour in Asia. However, Bo Gum revealed he was not tired because every time he met fans, he felt his energy was replenished. asked, which hairstyle is more Bo Gum like, long or short? Bo Gum feels comfortable with short hair, but with long hair like that he feels it looks okay too. The next video is the Best 3 scene in ‘Encounter’. The first scene is the scene of confession. From the scene, Bo Gum learned a lot to advance confess his feeling. The second scene, wearing gloves. Bo Gum said it was a form that he wanted to always be near someone he loved. The last is singing on the phone, this is very romantic that makes fans scream enthusiastically. In order for fans to feel closer to Bogum, fans have the opportunity to react to the scenes in ‘Encounter’ with Park Bo Gum. 3 lucky fans were able to react 3 out of 5 scenes on the screen. 3 selected scenes are: wearing a scarf, back hug and selfie with Bo Gum. Of course this is an unforgettable memory for fans! Through Bogum’s return to Indonesia, he wants fans to always remember him. So Bo Gum has prepared DIY diffuser for one lucky fan. Bo Gum stated, this was the first time he had made a diffuser, so he would include materials according to the fans’ suggestion. As fans’ suggestions, the diffuser theme is Jakarta, with pink sand. Seeing this sand, make Bo Gum want to have a vacation in Bali or Lombok. Because the theme is Jakarta and according to Bo Gum Jakarta is synonymous with trees, he added tree accessories to glass. With focus and thoroughness, Bo Gum arranged diffuser accessories according to the fans’ suggestions. Banana, watermelon, heart logo and beams with Park Bogum’s initials, PBG filled the glass. Then Bo Gum mixed candles with the aroma and glitter that is also chosen by fans. This diffuser is made specifically for one lucky fan based on the draw. Bo Gum also wrote the name of fan in a glass. What a lucky fan! Not only a diffuser, Bo Gum has also prepared other gifts for fans including: a clothes that are similar to the clothes he wore in Encounter, a calendar with Bo Gum in long hair, one seaweed instant rice, a limited edition lightstick with signature, season greeting; so that fans can spend days with Bo Gum, shoes; so that wherever the fans go they are still on the best path, doll, 2 clothes that he had used to shoot advertisements and were signed, photo cards, posters and polaroid with signatures that Bogum took while he was travelling. sang “Let’s go see the stars” which was released on 2018 October 11th , for the first time in Jakarta. Using a Floral pattern shirt and beret hat, Bo Gum sings while surrounding the fans in each section. Bo Gum’s arrival was greeted enthusiastically by fans who wanted to get closer to see Bo Gum and listen tohis melodious voice. Bo Gum’s melodious voice was heard again when he sang IU’s “Through The Night”, Encounter OST “Always Be With You” and Moonlight Drawn by Clouds OST “My Person”. 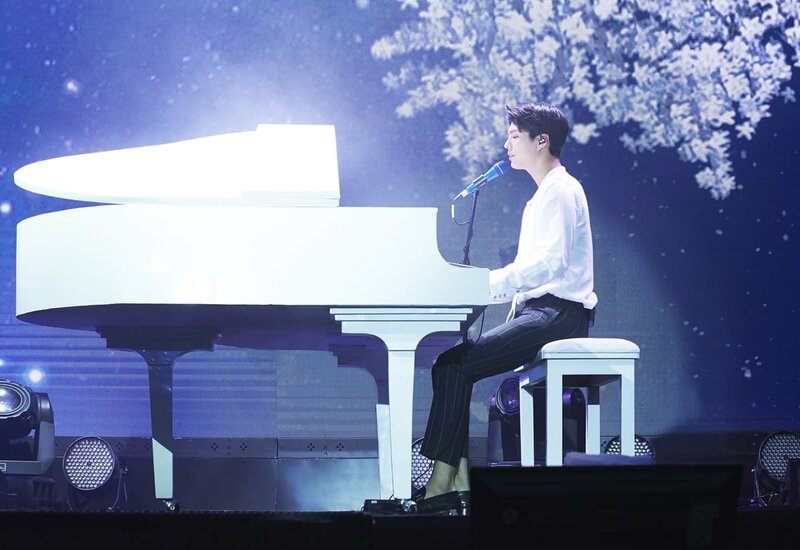 The music and the harmonious voice of Bo Gum made fans drifted away to the songs, it made fans sing along together during the song. Park Bo Gum reappeared with 2 back dancers. The fanmeeting atmosphere changed as if it was a pleasant concert when Bo Gum performed “Bounce”, “Honey”, “With You” and Moonlight Drawn by Clouds OST “Swallow Your Heart” with some fun choreography. Bo Gum asked fans to stand up, so every fans who come can enjoy the songs. The thing that needs to be appreciated is how Bo Gum danced so well that fans really enjoy his performance. The next song, Bo Gum sings while playing the piano. Before singing, he asked fans to sing together. The sound of the piano, when the first verse of the song was sung, fans shouted enthusiastically. Bogum sang Chrisye’s “Untukku” again, which he had sung at the Jakarta 2017 fanmeeting. Accompanied by the piano ringing, fans sang along together. Not only that, fans were shocked again when Bo Gum sang a song by Rizky Febian’s “Kesempurnaan Cinta”. When finished, fans shouted “한번 더! (Again! )” repeatedly. As requested by fans, Bo Gum sings “Kesempurnaan Cinta” again. After singing 10 songs, Bo Gum revealed, “This day is unforgettable because I can hear all of you.” The next session is a photo session. With a few bouquets of flowers, lightstick, hand banner and bunny hat from fans, Bo Gum stood on each corner of the stage so fans could take pictures and then continued photos together with fans. Bo Gum thanks all fans and said that he will try to be better in the future. Bo Gum also continued if this song is the last song, which make fans sound sad because they still want to see him. Bo Gum sing “One Candle”. Not only dancing and singing, Bo Gum also can rap really well. Bo Gum sings back down from the stage to approach fans in each section. Really, Bo Gum is a multi-talented actor who managed to make fanmeeting like a concert with his extraordinary fanservice! After the performances were complete, the stage turns dark. But the screen (“Park Bogum” I wanna hear that), made fans keep calling Bo Gum to return to the stage. The music is heard again with the appearance of Bo Gum doing dance cover ‘What is Love?’ from TWICE and ‘Pretty U’ from Seventeen. This dance cover performance continue to show Bo Gum’s skill in dancing which is very flexible. Arriving at the end of the event, the last song titled “Blessing” will be the closing of 2019 Park Bo Gum Asia Tour “Good Day” in Jakarta this time. In this song, Bo Gum distributes the signed ball. In order for all fans to get the ball, Bo Gum went back down and surrounded the section to give it directly to the fans. Really, The King of Fanservices indeed! Bogum said he had prepared a letter for fans who were attended today and this fanmeeting was closed with hi-touch with fans from all sections. Bo Gum cannot promise when he can return to greet Indonesian fans, but he promises to do his best for the next project. Thank you Park Bo Gum for your amazing performance and fanservices! See you again, Bo Gum and thank you very much for Mecima Pro who invited us to witness the amazing fanmeeting of highly multi-talented actor!